If you think eating at a food court means you have to choose between a soft pretzel dipped in cinnamon sugar at Pretzel Time or a Whopper and fries from Burger King, think again. The food court, once a staple in suburban mall culture, has matured and found a new life in New York City. In the past decade, food courts and food halls have sprouted up all over Brooklyn. One of the newest food courts to open in Brooklyn is the famed DeKalb Market Hall, which has transformed downtown Brooklyn with its mega food hall housing outposts of some of New York City's best restaurants including the legendary A Taste of Katz's (you might remember it from the classic scene in When Harry Met Sally), fried chicken sandwiches from Wilma Jean, key lime pie from Steve's Key Lime, BBQ from Fletcher’s Brooklyn Barbecue, among many others. The DeKalb Market Hall, located in City Point, is just one of many incredible food courts and food halls in Brooklyn. Another large food hall set to open is the Brooklyn Navy Yard's Building 77. In addition, the Gotham Market at the Ashland is delighting diners in Fort Greene with many artisanal vendors. If you want to sample some of the best cuisines Brooklyn has to offer, the food court is a great way to try out various restaurants without having to commit to an evening in one place. From old favorites to authentic Asian eats at a food court at a supermarket in Brooklyn's Chinatown, here's your guide to food halls and food courts in Brooklyn. In addition to the permeant eateries at this 16,000-square-foot hall located on the ground floor of a posh Fort Greene apartment building, the Gotham Market at the Ashland periodically hosts pop-up restaurants for local chefs. However, you don't have to wait for a local celeb chef to start dishing up culinary sensations because the regular vendors at the Gotham Market at the Ashland stand out as some of the best in Brooklyn. From the tasty brick-oven Neapolitan-Style pizza at Apizza Regionale to the Southern comfort food at Mason Jar, this food hall is teeming with some of the best food in Brooklyn. Breakfast aficionados must head to Egg at the Bird, where you can start your morning with egg sandwiches, granolas, frittatas, house-made bread, baguettes, and bialys, along with coffee from Devoción in Williamsburg. Conveniently located steps from BAM and a short walk to Barclays Center, this is the perfect spot to enjoy a decadent meal that won't break the bank before a performance. Of course, you don't need tickets to events at neighboring venues to enjoy Gotham Market at the Ashland, because this food hall is a destination in itself. DeKalb Market Hall, Brooklyn’s "newest innovative culinary destination" located in Brooklyn’s City Point, opened to the public in spring 2017 as "notably one of the largest food halls in the country, offering a distinctly Brooklyn point of view." The 33,000-square-foot space is home to 40 local and regional food outposts including the Arepa Lady, Steve's Key Lime, Home Frite, Eight Turn Crepe, Ample Hills Creamery, Bunker, Wiki Wiki, Fulton Landing Seafood, and A Taste of Katz’s where the famed deli has expanded and opened its first new outpost after decades at its Lower East Side location. If all of this food isn't enough for you, DeKalb Market Hall hosts daily entertainment programming in its two dedicated spaces: a custom-built show kitchen and an event space, DeKalb Stage, as well as a 40-foot bar designed by Brooklyn artists. Serious home chefs will love the nose-to-tail grass-fed butcher, a fishmonger, an artisanal cheese counter, and an on-site bakery. After you've had your fill of good eats, see a flick on the oversized screens at the Alamo Drafthouse or peruse the racks at Century 21 at City Point. The Brooklyn Navy Yard is an important part of Brooklyn's history and in recent years has undergone a transformation becoming home to a rooftop farm known as Brooklyn Grange, a rooftop vineyard known Rooftop Reds, a film studio, a museum about the Navy Yard's history, and many other spots. It plans to embark on yet another venture when it opens a 60,000-square-foot food hall at the Brooklyn Navy Yard. The food hall will house outposts from numerous local restaurants. Grab a smoothie from Brooklyn Greenery, dine on Caribbean food at The Food Sermon, enjoy some Korean BBQ from We Rub You, and many other vendors. The anchor restaurant at the Food Hall is from Russ & Daughters, the famed Lower East Side appetizing store, and is sure to please the brunch-loving crowd. Don't forget to order some lox to go. If you have a sweet tooth, you should spend an afternoon at the Food Hall in Industry City. The Food Hall on the ground floor of this mammoth industrial home to artists and makers has outposts of Colson Patisserie, One Girl Cookies, and Li-Lac Chocolates, all of which could satiate any fan of sweets. 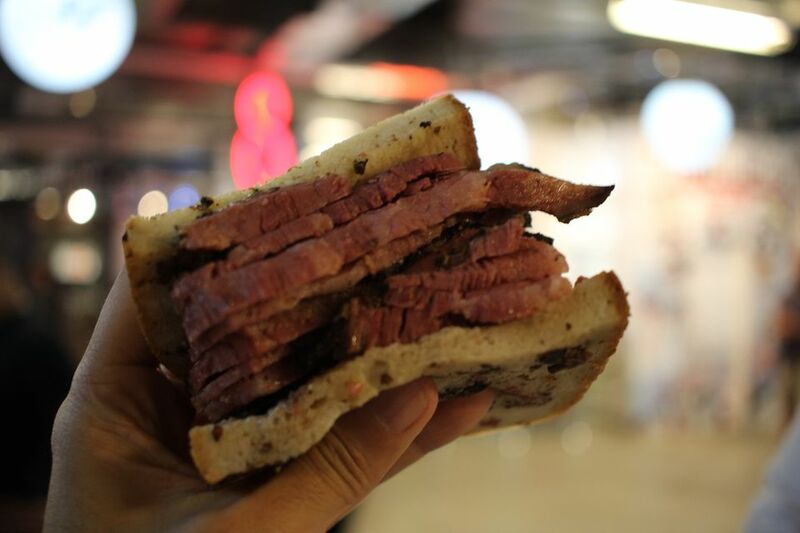 If you're looking for a savory fare, pop into Ends Meat for a sandwich made with Italian style meats. Note that the Food Hall is open weekdays, and on weekends some of the restaurants are closed. Industry City is also home to numerous food festivals throughout the year, so check its website for a list of upcoming events. If you do head to Industry City on the weekend, you can enjoy a cocktail at the Industry City Distillery. This Crown Heights Beer Hall, from the folks at the Brooklyn Flea, also houses a well-curated food court. If you want to taste some of the best food to come out of the Smorgasburg, head to Berg'n and order some decadent BBQ from Mighty Quinns, a traditional New York pizza from Pizza by Charlie, a grilled cheese supreme from Landhaus, or a breakfast taco from King David Tacos. Don't forget to wash it down with a beer. It's not just about the food and drinks at Berg'n, the atmospheric spacious hall and event space has a calendar packed with events including drink and draw nights and Tuesday trivia nights. Berg'n is also a great place to watch awards shows, the Super Bowl, and basketball games on the big screen. Just to note, Berg'n is closed on Mondays. Foodies flock to the food court attached to the Fei Long Supermarket. With nine choices including the popular Shanghai Dumpling House and Sakura known for its teriyaki, you can feast on a variety of Asian specialties at the food court. Grab a seat as you dine on noodles, rice dishes, soup dumplings, and other good eats. Although there are vegetarian options, vegetarians should be warned that there is a large display of roasted ducks at the food court. Bubble tea fans must stop by Mango Empress for an assortment of flavorful bubble teas such as a taro milk bubble tea. If eating dumplings and other Asian cuisine inspires you to cook, you can easily spend hours perusing the aisles of the Fei Long Supermarket, packed with specialty items and everything you'll need to make your own dumplings at home. This food court is deep into Brooklyn, but worth the trip. An added plus, they have a parking lot. If you take the train, spend the afternoon strolling down bustling Eighth Avenue in Sunset Park's Chinatown.